Lucy was a very active German Shepherd teenager at the shelter. As you can see below, she has found the perfect home with a family committed to working with her on her behavior. Her mom tells us, “Within a week of being home, she was a completely different dog. 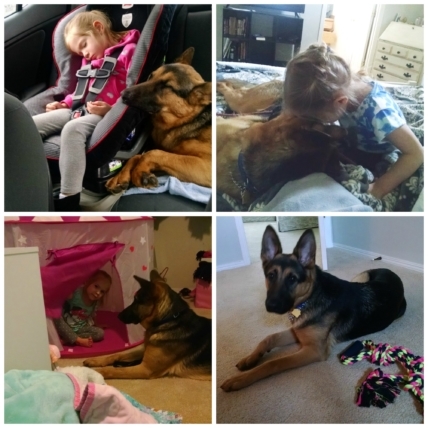 With socialization, daily exercise, and consistent expectations she is turning into an amazing, loving, well-mannered dog, and a wonderful companion for me and my 3 year old daughter. She loves to go for long runs, fetch, the dog park, and snuggling with her little girl (the picture of my daughter kissing her was literally taken as I’m writing this! ).